Foster children's interest in the natural world and offer birds fun nesting spots using these Gardman Woven Rope Acorn Roosting Pockets. This club package is great for scout groups or a classroom. The familiar shape and natural, rope body make each home a wonderful addition to your backyard, and is perfect for getting children interested in birding. The 6.25" diameter top extends outward over the rounded shelter, creating the familiar acorn silhouette and protecting the square entrance from rain. This entry allows birds to access the pocket easily, and its woven rope construction ensures the home stays well ventilated. A rope loop at the top of the piece enables it to hang from a hook with ease, and the small size means you can place several throughout your yard for a busy sanctuary. 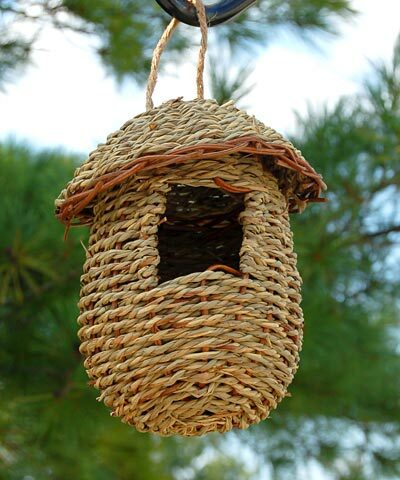 Enhance the natural shapes in your backyard and provide birds convenient homes with these Woven Rope Acorn Roosting Pockets.